Are you still looking for gifts for the person who has everything? You’ve got to check out Celery Street! They have awesome eco-friendly, recycled, reused, and refurbished gifts, housewares, and other practical items for everyone. Celery Street also has handcrafted jewelry, candles, bath products, apparel, pet gear, home decor, rugs, bags, purses, totes and so much more! 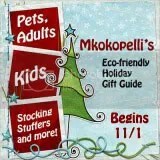 They have a eco gifts section where you can choose gift for her, gifts for him, for the kids and for the pets. I love when shopping is made easy! Celery Street sent me the mother of all tote bags- the Night Bird Overnight Bag. We don’t travel often, but the bag could fit enough stuff to get us through a weekend. It’s HUGE! Ella went with me to the townhouse this week to do some work. I thought I’d pack up the Overnight Bag with her toys so she’d have something to do and wouldn’t try to help us. I was able to fit a bag of blocks, a box of Sprig Toys, her Monsters Play All Day 3 tower box, crayons, 2 art pads with some loose paper, some spare clothes, VHS tapes and other little things- and still had room! The Night Bird Overnight Bag is 27.5” x 13.75″ The Bag zips shut, so you don’t have to worry about anything spilling out. It is made with 90% recycled materials of HDPE bottles and grain sacks that are ground up and melted into rolls of recycled plastic. I love how large the bag is! It’d be great to pack toys in when dropping your child off at a friend’s house or with the grandparents. Sorry, I always think about Ella before myself. The bag is designed for women and its elegant black design with a bird singing is gorgeous. I know I’ll be using it for my next road trip- whenever that might be! It is a very durable bag and would even be great to take to the market, shopping, or to the pool. The Overnight Bag is very light weight, so what you add to the bag will be the weight you are carrying. You can get the Night Bird Overnight Bag for only $17.99!! That’s an awesome deal! Celery Street also has a variety of Tote bags including shopping bags, shoulder bags, bucket bags, courier totes and more! They range from $9-$56, though most are under $20. How to Enter: Go to Celery Street and tell me another product you’d like to have. Make sure to leave your email address!! I cannot contact the winner without it! New disclaimer: I was sent this item to review from Celery Street. This is NO way changes my opinions about the products or company. These are my thoughts, opinions and results. I follow you & so much more out of time to post the rest! I so follow on google friends connect! I would love to own /have the Address Books – French Ornate Vert Slim! I have the smaller one & it is truly fabulous! I would love to own the mathcing bigger slimmer one to for my private numbers *wink wink*! I like the Flower Recycled Zipper Pouch! I lke the recycled silver plastic waste basket. Cute and something I'd put to good use! I like the Sunburst Recycled Plastic Rug. Handcrafted Bracelet “Emma” is very nice too. I really like the Small Messenger Seatbelt Bags in Chocolate and Light Pink. That is so cute. I also love the Recycled Bracelet from Comic Books, thanks! I have to tell you I just love this bag! And then I went to the site, and what great stuff! Everything! I have saved this site in my favorites, I truly liked all of their stuff. I think first of all I would pick the Storybook Purses Sendak's Wild Things, though, my grandchildren would bounce off the wall if I walked in with that!! Adore the Boss Lady Shoulder Bag. I joined the Eco-friendlist newsletter. I'm a fan of Celery Street on FB (Cherries Lacey).